I am hostess this week at Just Us Girls and it’s the 5th Saturday of the month and that means it’s Wild Card Week. In another words…I can select just about anything. 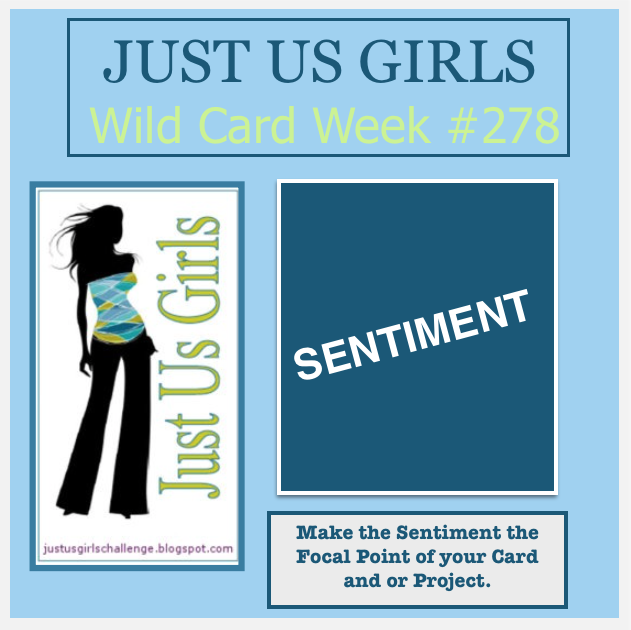 I wanted to make it relatively easy, so this week the challenge is to make your Sentiment the Focal point of your card and or project. Love this idea and when we were making our selections about a month ago, I hadn’t seen this type of challenge in blog land all that much, but now it’s everywhere. LOL Oh well, that’s okay! You all have had some practice then. I used a mix of SU (flower) and Verve ( U/beautiful) stamps to make my sentiment pop! The R was cut out with my new SU die cut letters! I think my Cricut is going to start collecting more dust now, using these dies and my Big Shot is so much faster. The dots were added by hand. The flower die is from MFT. The rest is self explanatory. Categories: Cards | Tags: Card making, Cards, rubber stamps, stamping, Stamping Up, Thinking of you, Verve Stamps | Permalink. 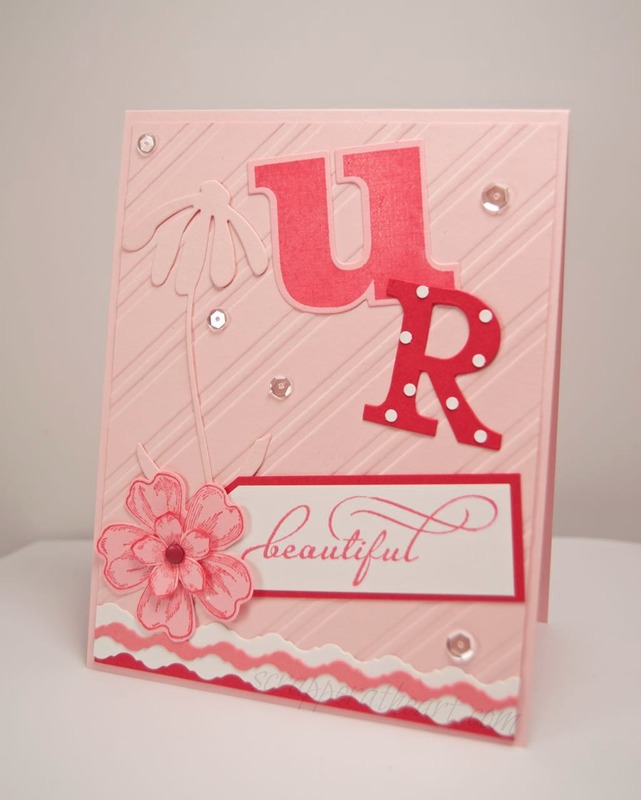 Lovely card – the bg embossing is awesome! I, for one, have not seen this specific challenge. It is very tempting and as you said easy to do. I love your monochromatic card with the sentiment that is the focal point. Lots of texture going on but the sentiment still stand out. Love this idea. Hope that I can play. What a lovely card! The soft colors of your background really make the sentiment pop! Well done! That is an awesome card. Love the design! So beautiful Nancy! LOVE the dots on the R !!! Beautiful card. Love all the texture and the focal sentiment. Great choice and great card. This is really awesome looking Nancy. I love the pink! Loved the soft colours you used Nancy. Fabulous card. I love the stamps you used. I have the petite petals but not the other one. Those huge letters are just great against the background. Super layout and Wild Card challenge. I really love the colors on your card……really beautiful! I love the big letters and especially the dots on the “R”. Lots of cute details! Love the soft colors and the subtle details on this beauty! Great challenge this week. Such great composition! Love, love, love this, Nancy! It’s way cool how you did the flower in the same color as the background! Very effective!! Thanks so much for having me as Guest Designer this month, I had so much fun!! You are so welcome Judy! HUGS!